Below are some questions that you may be asking yourself. If you have a question that isn't answered here, please call or email us and we'll be happy to add it, and of course, answer your question directly. Q: I Live In A House With No Chimney Or Flue – What Fires Can I Have? If the wall where the fireplace is going is an outside wall you can have a Balanced Flue or Power Flue Gas Fire. These fires expel fumes horizontally outside rather than vertically into a flue or chimney. Another more recent option are Flueless Gas Fires. Flueless appliances incorporate the latest in gas technology using a catalytic converter which the combustion gases pass through converting carbon monoxide into harmless carbon dioxide and water vapour. The result is an appliance which is 100% efficient and is fully tested and approved to meet all current relevant safety standards. There are minimum room size criteria to meet and ventilation requirements in order for the appliance to work safely together with a gas supply. Finally, Electric Fires are extremely popular due to the large range of designs and convenience. The latest range also incorporate ultra realistic flame effects and installation is often as simple as placing it where you want it and plugging it in! For further information please visit the “Flue Types” page. Q: I Can’t Find The Fire I’m Looking For. We have carefully selected a stunning range of contemporary and traditional fires and fireplaces from leading manufacturers. However, if you have seen a product you like which isn’t on our site please let us know and we should be able to beat any price you’ve been given. Q: Do You Offer A Price Promise? Yes. We promise to beat any of our competitors prices as long as the product is like for like and agreed prior to ordering. Q: Do You Offer A Fitting Service? Yes. We offer a full fitting service but please be aware that we may decline to fit any products we sell. Q: I Have Seen A Gas Fire For Under £100, Can You Supply These? The Exquisite team have been selling fires and fireplaces for a long time and often get contacted by companies offering ‘bargain’ gas fires. These fires are usually made in China, using cheap materials and offer no back-up service should anything go wrong. It is also virtually impossible to locate replacement parts for these fires. Whilst we try our hardest to offer you the lowest possible prices, we will not compromise on quality and safety by selling inferior products. The purchase of a fire or fireplace is an extremely important decision and we want you to enjoy your fire for years to come. Q: If I Buy A Gas Fire With A Pebble Or Driftwood Fuel Bed, Will They Discolour? Most gas fires will produce some levels of carbon soot over time which is produced when the flame impinges on the fuel bed of the fire. On coal effect fires this won’t show too much but on lighter fuel effects such as pebbles and driftwood this will be more apparent. Regular maintenance such as removing the fuel effect and lightly brushing the carbon deposits off should help with this but please bear this in mind when choosing your fire. Q: Will My Chimney Need Lining To Have A Gas Fire? In most cases, unless your chimney is leaking, you are not required to line your chimney to have a gas fire. Your Gas Safe Registered installer will assess the condition of your flue prior to your installation. If, after assessment, you require it lined, then the type of fire you have chosen determines the liner size you’ll require. Q: Will The Fire I Choose Be Sufficient To Heat My Home? The majority of modern gas fires are designed as a back-up to central heating. If you are looking for a fire specifically as a heat source please contact us, on 0115 916 6001, so we can advise on which fires will be more suitable. Yes, to most Mainland UK addresses. For deliveries to a small number of remote areas, there is a small charge to cover extra costs charged by our delivery company. We offer free delivery for gas and electric fires. Some remote areas may incur a small charge of £15 (plus VAT), please phone us on 01159 166 001 to see if you are entitled to free delivery. Fire surrounds may cost up to £75 (plus VAT) to deliver depending on the weight and area. Q: Why Do The Products On Your Web Site Not Have Prices? Unfortunately, several manufacturers have an internet policy that will not allow us to display prices online for their products. For unbeatable prices on any of these products please call us on 01159 166 001. Q: Why Do You Only Deliver To The Card Holders Billing Address? This is a precautionary measure we’ve had to implement to protect you the customer. Unfortunately fraudulent use of credit cards still exists and this is one of the ways we ensure that no one is using your card illegally. We hope you understand that this requirement is for your protection. Q: How Soon Will I Receive The Item I’ve Bought? We hold a large amount of stock for popular products and these get dispatched within 5 working days of placing your order. Out of stock items usually get delivered within 10-14 working days. For certain special order or non-stock items please allow up to 28 days. Q: I’m Cautious About Giving My Credit Card Details Over The Internet. We currently only carry out purchases over the phone or in store. Please call 01159 166 001 during office hours and an adviser will be more than happy to help you. 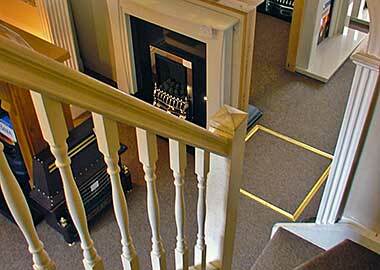 Alternatively, you can visit our three floor showroom. Q: Will My Fire Come With A Guarantee If I Buy It From Exquisite? Yes, of course. We are official suppliers for all the products on our site and and therefore you will receive a full manufacturers warranty for any product you buy.